The distinguished panel of educators, academicians and thinkers, moderated by Peabody and Emmy Award-winning journalist Soledad O’Brien, had come together in the sedate environs of Howard University’s Founders Hall to have, they perhaps thought, a dispassionate discussion on high schools. And then came the students’ questions and complaints. Other students said their school curriculums were dumbed down, uninspiring and stunted learning. They talked about floors so bad that adults had fallen through them. The panel discussion will be aired Oct. 4 on public television stations WETA and WHUT. 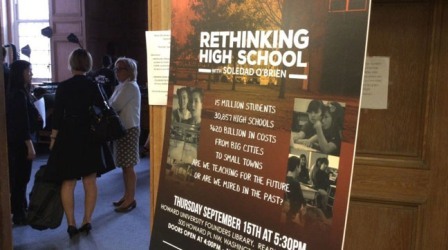 Such was some of the discussion last week during a special town hall event, “Rethinking High School with Soledad O’Brien,” an hour-long taped program on how to make the nation’s high schools better. The program will be aired Oct. 4 on public television stations WETA and WHUT. The panel included D.C. Public Schools Chancellor Kaya Henderson, Tony Wagner, an “expert-in-residence” on education with the Harvard Innovation Lab; Andrew Rotherham, co-founder and partner at Bellwether Education Partners, a consulting firm for educational institutions, and Aris Pangilinan, a STEM teacher at Washington’s Francis L. Cardozo High School and DCPS high school student Jenesis Duran. The experts offered insightful, though-provoking discussion on current curriculum standards, the effectiveness of teaching technologies, and innovative solutions for the future of public schools. But, it was the students sharing their concerns about their schools that really stood out during the taping. For instance, when the question was posed by O’Brien about how to instill curiosity in students, Duran told the audience that schools don’t help to foster students’ natural curiosity. “Curiosity, I don’t think, can be taught,” she said. “I think it’s harvested by really accepting individuality, and once you can accept this individuality and learn how to go with it and learn how to harvest it in students, that’s where you can really see improvements. Students' thoughts and complaints were an integral part of the discussion. Henderson agreed with Duran that schools aren’t nurturing students’ natural curiosity and then tried to provide solutions. Henderson said she is doing everything in her power to fix crumbling schools with a budget that has increased to $950 million from $750 million. She agreed that schools don’t have enough counselors for students. Members of the audience said they thought the panel was very helpful and informative and appreciated the range of professions and ideas presented. Cheryl Rodgers, director of the TransSTEM Academy at Cardozo High School, said she thought the panel was an excellent way to see what drives people. It motivated her to continue to listen to students and push them to their highest potential, Rodgers said. Joanne Rietta, a parent of two public high school students, said she thought the discussion was good and really focused on making high schools a place to solve community problems.